Our husbands are such an important part of our lives. They are our best friends and soul mates, and we want to do everything we can to let them know how much they mean to us throughout the year, and especially during the holidays. Most of us will admit that there have been a few times when the pressures of holiday shopping, decorating and entertaining have filled our lives so much that it wasn’t until the last minute that we could focus on searching for Christmas gifts for our husbands. I know when my husband and I first got married, that was definitely the case with me, anyway. I’m not sure if I would put off shopping for my husband because of the demands in my daily life, or to be honest, if it just wasn’t that I had no idea what to get him, but I can’t even begin to tell you the number of times that I ended up purchasing a generic ball cap, a set of screwdrivers, or some other impersonal item at the very last minute. If this sounds like you, you have come to the right place. Christmasgifts.com has an abundance of unique Christmas gifts for men, and in order to make your shopping adventure a little easier, we have put together a list of some of our favorites to help inspire you this holiday season. 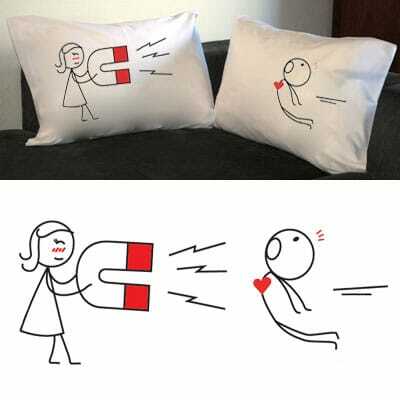 If you are looking for a flirty way to show him how much you care this holiday season, these You’re Irresistible Couple Pillowcases are a fun and creative choice when it comes to Christmas gifts for men. These adorable pillowcases feature a girl stick figure that is holding a massive magnet on “her” pillowcase, and a boy stick figure who is being drawn to her magnetism on “his” pillowcase. 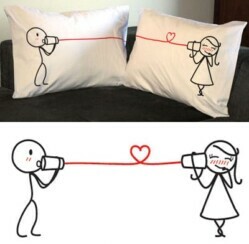 Measuring approximately 30 inches x 20 inches, these unique pillowcases are designed to fit most standard and queen size pillows. Enjoy your morning coffee with the man in your life when you order these Love Has No Distance Couple Mugs this Christmas. 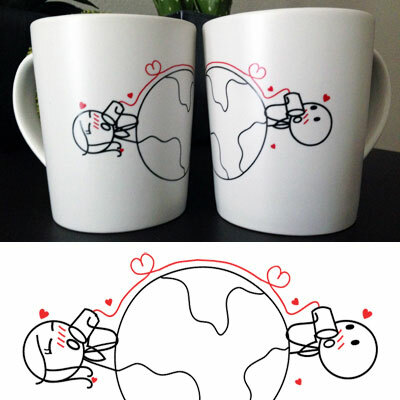 These unique mugs are designed to remind you that whether you are right next to each other or miles apart, your everlasting love for each other is always there. Each creatively designed mug features the planet earth, with a girl stick figure on one side and a boy stick figure on the other side, and a tin can telephone connecting them. Measuring 4 inches high and 3 ½ inches deep, these mugs are designed to hold approximately 14 oz. of your favorite beverage. 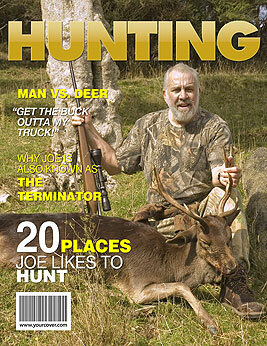 Put your favorite man front and center on the cover of his very own fake Hunting Magazine this holiday season. 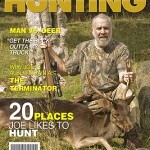 This unique gift features a realistic looking front cover for you to add you favorite photo of him, customizable headlines that you design to reflect his personality, accomplishments or even feature his best hunting trophy, and offers an exclusive back cover to add your personal message, additional photos or even more information about the man in your life. These magazine covers make wonderful last minute Christmas gifts for men too, since you even have the option of downloading your creation and printing it right from your home computer. Do you have more unique ideas for Christmas gifts for men?